This installment of the Book of Magic-series clocks in at 16 pages, 1 page front cover, 1 page editorial, 1 page advertisement, 2 pages of SRD, 1 page back cover, leaving us with 10 pages of content, so let’s take a look! All right, after a neat introduction, we move straight on to the new spells contained herein – and before you ask: They take the ACG-classes into account regarding their spell-levels, but alas, not the occult classes – particularly weird since we get new class options there later…but anyway, let#s take a look at the spells, shall we? Death incarnate requires that you’re a dragon and is level 8 and makes you undead for the duration – sans HP recalculation, but with a DR, immunity to cold and electricity, doubled frightful presence range and extra negative energy damage with claws. ODD: “which can used to heal yourself in your undead state as a full-round action” – so, does only the bonus damage heal the dragon? One total or that of two claws? That whole construct is wobbly. Deflect breath weapon is an interesting spell: It sports evocative visuals for both cones and lines and nets massive bonuses to Reflex saves as an immediate action spell – I am a bit torn here: While I like the visuals, the spell does take away from the deserved paranoia and fear that breathing dragons should cause. Cool: Elemental fear causes energy damage to those struck by your frightful presence, slashing if you have no breath weapon. I am pretty sure this spell was intended to be a dragons-only-option, which it RAW is not. Fear focus makes this problem more apparent: It focuses frightful presence into a cone and forces the targets to save – on a success, they become frightened, on a failure panicked. At 3rd level, that is highly exploitable for characters that managed to get their hands on some sort of frightful presence – at this level, there usually is a negate option for successful saves. Also weird: The spell notes as level only sorcerer 3 – does that mean that wizards can’t cast it? Or is that just a glitch? Heartseeker is a level 1 spell (level 2 for cleric/oracle/shaman) that adds 5 + CL, maximum 15 negative energy damage to a weapon’s next attack. Lure of greed enchants a coin. All dragons within long range, sans requiring line of sight/effect, must attempt to get to the coin and once they reach it, the stand captivated in front of it. The spell contradicts itself: It notes that Will negates, but the text mentions that it requires saves on subsequent rounds. It also doesn’t cover what happens when multiple dragons seek to claim the same coin and at 3rd level, it is pretty low for the powerful compulsion it RAW presents. Manifest greed manifests a targeted dragon’s greed as an ectoplasmic creature with DR 10/-, one size category larger than the dragon and it has all natural attacks and the target’s armor class and is one size category larger than the dragon targeted. Yeah, that’s not how that works in PFRPG. Okay, what type has the manifestation? If it has a larger size, what if the dragon’s Colossal? Size-increases change stats, AC and attacks. Beyond that, an allied dragon could potentially double its destructive effectiveness, provided the spell worked as it should. Scale lock targets dragons or reptiles: The target becomes automatically grappled and then, you use the target’s CMB to deal damage to it. The target creature can attempt to grapple versus its CMD to be able to move. Two successes are require to break free of the grappled condition. Oh boy. The math here is a mess. Can the scales pin the target? Do two successful checks end the spell? Shredding scales is a 2nd-level burst that causes slashing damage via your scales. Spell envelope is a cool idea: You create a spell cocoon, into which you place another spell before the end of your next round: SR versus the spell placed is reduced by 5. This is a VERY cool option. However, nearby casters may also place spells in the cocoon, which makes it less clear when the spell in the cocoon is hurled towards the target. As soon as it’s placed inside? On your next turn? More importantly, the effects stack with feats etc. that reduce SR – but which character may use these? Is the caster of spell envelope the guy to check for these feats or the one that placed the spell in the cocoon? Or both? This is a really cool spell, but that aspect needs some explanation. Same goes, obvious, for the greater version. We also get a total of 5 summon extraplanar dragon spells, which are thankfully relegated to the higher levels. Tainted treasure poisons a hoard and is ridiculous: It deals 1d4 Constitution damage (erroneously referred to as Con once in the text) for 7 rounds to a dragon that touches it. Fort save each round for half damage. Oh, and guess what? It’s not a poison, RAW – no immunity. This has an excellent chance of killing or severely crippling dragons. It’s also a level 4 spell and highly situational. Still, this needs a serious whack with the nerf-bat. Wheeze on the other hand is cool and interesting – it increases the breath weapon reset time by 1d6 rounds on a failed Fort-save. Big kudos! Wounding wheeze adds your choice of either fire or acid damage when the target uses its breath weapon – interesting. Wings of the wyrmling gets rid of age-related Dexterity penalties and improved maneuverability to average. Solid. We also get some draconic class options herein, the first of which would be draconic implements for the occultist. As a resonant power, we have natural armor increases and the base focus power lets you, as a standard action, expend 1 point of mental focus, conjuring draconic shape that causes fear – the number of targets affected is limited by range, mental focus invested and by the HD of the targets – high HD-creatures in relation to your own HD suffer less. Impressive! The focus power include breath weapon, form of the dragon, better senses, temporary hit points or wings – all of which sport some sort of nice scaling. As a minor complaint, the ranged touch-based conjuring of a spectral dragon maw should probably at least cause force damage – RAW, it is untyped. The option does come with its own spell-list – and as a whole, I’m pretty surprised. I liked this! There is a variant of the enchantment school for the wizard, one that replaces enchanting smile, dazing touch and aura of despair. Sly master nets you a scaling bonus to the social skill checks and as a capstone, it lets you recast enchantment spells of an equal or lower spell-level after saving versus an enchantment spell. Interesting. The option also nets an aura (that does not specify when it’s gained) that penalizes saves versus fear and mind-affecting effects, with higher levels increasing the range. Dragons targeted with fear or mind-influencing effects gain a bonus to bypass SR. At 8th level, enchantments cast versus dragons get a much higher save – interesting. 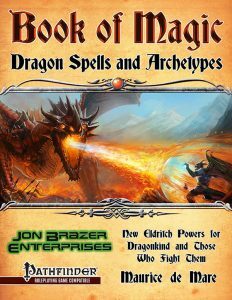 There are also two arcane discoveries: Dragon wizard lets you target dragons with spells that target specific creature types – I think this should specify one type; RAW, it can yield some weird interactions. The second one nets you further bonuses for bypassing SR. We also gain the dragon spirit for the shaman: Increased movement rate and Nimble Moves, swift action-base sense enhancement, a fear-inducing gaze, a natural armor-bestowing ward and blur. The spirit animal gains natural armor bonus and a minor (or increased) fly speed – that does not specify maneuverability, alas. The spirit abilities net a limited use untyped damage causing melee touch attack (why not type it?) and at 11th level, the shaman treats all weapons as keen. The greater spirit ability yields fire resistance 5 and 3/day a 15-ft. fire breath (1d6 per class level!) with a 1d4 cooldown. In case you’re wondering: Yes, this is a linear improvement over fiery soul. 5 resistance less for an upgrade of 1d4 top 1d6 per level? Yeah, ouch. The true spirit ability yields form of the dragon II and the manifestation capstone nets fire resistance 20, immunity to paralysis and sleep and 60 ft. blindsense. Editing and formatting are good on a formal, but leave something to be desired on a rules-language level. While there are plenty of examples where the pdf manages to get this right, there are quite a few inconsistencies in the finder details. Layout adheres to a solid 2-column full-color standard with a while background and interior artwork is solid, full-color stock. The pdf comes fully bookmarked for your convenience. Maurice de Mare’s dragon spells and archetypes are an odd bunch: On one hand, they attempt complex and interesting things, offering some evocative and really amazing tricks – on the other hand, they stumble, more than once, in the details…and weirdly, not always in the difficult aspects. Still, this almost feels like the work of two designers or at least, like content created at different stages of one designer’s development. There are some rather problematic aspects herein, but similarly, one can find some gems. Still, this is not enough for a unanimous recommendation. If you’re willing to work a bit with the material, you may find some gems, but this is a mixed bag. As such, my final verdict will clock in at 3 stars.